Following a third and second at her first two starts, She’s A Goddess (3 f Tavistock – Shalaka, by Lonhro) delivered in no uncertain terms on 19 December in the $10,000 Carrfields Livestock Maiden 3YO 1200 metres at Matamata. She’s A Goddess had produced a bold front running debut third in the Maiden 3YO Fillies 1200 metres on 7 November at Avondale, and just missed (long head) when second to subsequent winner Weaponry (Declaration of War) in the Maiden 3YO 1100 metres on 28 November at Rotorua. Away well to settle outside the leader for rider Cameron Lammas on this occasion, She’s A Goddess quickened to a winning advantage at the 300m and showed nice stretch before easing near the line for a two and three-quarter length victory. “Last start she only just got beaten and was a little bit unlucky, really, but today we made sure she had all the luck possible and she did it quite easily,” Lammas said. “I was either going to be outside the leader, or one out and one back, and she did it nicely. Running the 1200 metres in a respectable 1:10.4, last 600m 35.4, she was well supported as race favourite and returned $2.50 & $1.20 fixed odds on the NZ TAB. 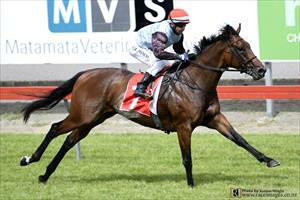 “She had produced two very good runs from two starts and the form around was good,” said co-trainer Pam Gerard. “She had come on again since her last race and looked a bold chance. Gerard said she feels that She’s A Goddess is capable of gaining black type and plans would be laid following discussion with senior training partner Mike Moroney. “We’ll place her where she’s got every opportunity,” she said. She’s a Goddess was selected by Paul Moroney and purchased for $22,500 at the 2017 New Zealand Bloodstock Select Sale, from the draft of Seaton Park. Bred by Murray Hardy and Paddy Preston (Sunlight Trust), she is owned by Gerard Peterson, Ken Millar, and Ballymore Stables. From a mare that won over 1200 metres, She’s A Goddess is her second winner. The other, New Universe (Darci Brahma) is the winner of five races up to 1400 metres in New South Wales, from the stables of Chris Waller. Further back in her pedigree sees the influence of breed shaping stallion Sir Tristram (Sir Ivor), as sire of her fourth dam, Eulogy Stakes winner Eau D’etoile, who in turn left Golden Slipper winner Bint Marscay (Marauding). It is also the family of dual Group One winner Filante (Star Way). She’s A Goddess was strapped by Hayley Ashcroft.